What he ended up with was pure brilliance: a trading system built more on physics than economics. The results changed his life for good. Now a self-made millionaire, he’s on a mission to prove that his system can help anyone make thousands of extra dollars a month from the stock market – regardless of their age, income, or past investing experience. It may be the most simple to use – and most lucrative – trading system ever devised. And Nathan Armstrong from St. Petersburg, Florida, really hit a jackpot, making an astounding $188,253 profit using D.R.’s system. The 10-Minute Millionaire Pro is all you need to get started. You’ll have the chance to learn directly with D.R. as he takes you under his wing and shows you step by step how to make these trades – and become a self-made millionaire from the stock market, just like him. Never before has such a market-changing investment system been available to everyday investors – with the chance to pocket double- and triple-digit windfalls month after month. 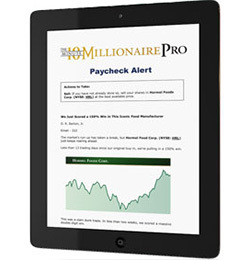 If you’re an 10-Minute Millionaire Pro subscriber, click here to login. If not, see below for more information about The 10-Minute Millionaire Pro. Hi. My name is D.R. Barton. If you give me 10 minutes, I’ll make you a millionaire! You’ll need no special training… no special knowledge… and no special skills. In fact, anyone with a computer or a decent “smart” phone can put $1 million in their account, as you’re about to see. I don’t care if you’ve never worked a day in your life. I don’t care if you start with $10 or $10,000. If your goal is to amass $1 million or more, that goal is within your reach. And you won’t have to wait years and years, either. The fact is, it’s entirely possible to do it in a shorter time than you ever thought possible, starting with just $500. The best part is… you can do it in small, effortless 10-minute increments, once a week. In fact, you’re about to see how – with only about six hours of “work” since January 1 – you could have already turned a $500 initial investment into well over $1 million. It’s more like “checking in” with the simple wealth system that I’ll show you how to use to make sure it’s doing its job – MAKING YOU MONEY. 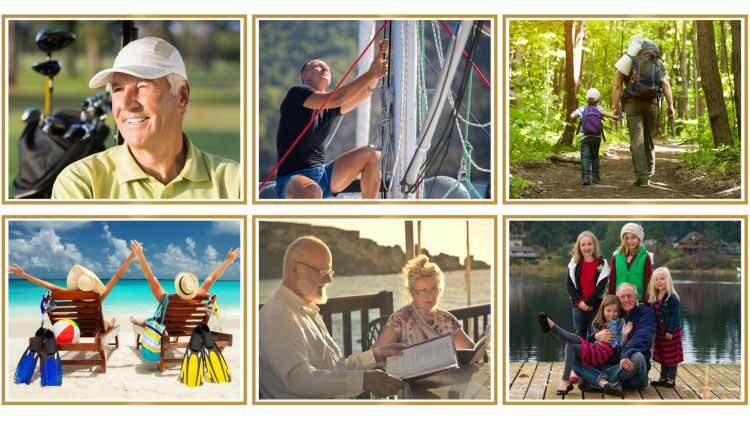 Playing golf, taking a sail, hiking, laying on the beach, enjoying a glass of wine at your clubhouse, or even paying it forward to your kids or grandkids. The entire system is designed to make you wealthy, and maybe more importantly, give you time to enjoy your life. It’s so powerful and so effective, I’ve laid it out, step by step, in a simple book that you can absorb lying in a hammock. Thousands of people have already put my book to work for themselves. Bob Martin started using my wealth-building system, and in just over 30 days he multiplied his money into $7,000. Jamie Newton found wealth that he probably never thought was possible the very first time he put it to use. He cashed out after just eight days with a $185,253 profit! Gabe Renneker was able to use it to make a 922% profit in 20 days. That’s more than nine times his money! Enough to turn just $500 into $5,110… or to turn $5,000 into more than $51,000 in under a month. Joe Nelson doubled his money over the first weekend of using this system. Plain and simple, the secret strategies you’ll learn about in my book have the potential to change your life the way they’ve already changed the lives of so many other people. And just like Jamie Newton, I want you to have the chance to potentially make a $185,253 profit in the next eight days! Because, if you’re like me, you won’t believe the power of this wealth-multiplying system until you see it working for yourself. That’s why I’m going to walk you through each profit opportunity, step by step, in live demonstrations. And remember, my promise to you today is NOT just to guide you through three opportunities to potentially make you tens of thousands of dollars in the next few days. And your next million after that. How is it even possible to go from a few hundred bucks to $1,000,000 or more in as little as 11 weeks? The fact is the math behind becoming a millionaire is so simple that the answer will surprise you. And it can all be summed up in one super simple example. And you TRIPLED that on January 9, 2017. That would give you $1,500. That’s a solid gain that most investors would be completely happy with on its own. But look what happens if you could take that $1,500 and DOUBLE it just a few days later, on January 25. Then what if you could DOUBLE that only nine days later, on February 3, giving you $6,000. Then TRIPLE it again on February 13. Now you’d have $18,000. And DOUBLE that 11 days later, turning it into $36,000 on February 24. 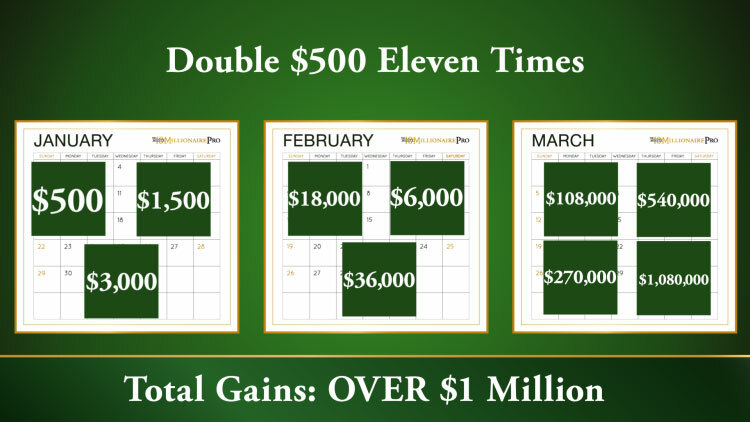 TRIPLE it again on March 1, and your modest $500 investment could turn into $108,000 in under two months. Then on March 13, only two weeks later, you could make two and a half times your money, turning it into $270,000. Four days after that, on March 17, what if that $270,000 could DOUBLE to $540,000. And then on March 24, it could DOUBLE to $1,080,000. After just 11 weeks, that $500 you started with is now worth well over $1 million. What I’ve just demonstrated is the unbelievable power of money-doubling. The mathematical fact is that you only have to double $500 11 times to accumulate $1,000,000 or more in wealth. Add a couple of triples in there and you could do it even faster. Of course, this simplified example is hypothetical. The entry dates of these opportunities didn’t line up perfectly to roll 100% of each profit into the next. A string of only winners that long would be pretty unlikely. And I would never recommend doing that anyway. These gains I just showed you – these doubles and triples – I didn’t just make these up. These are NOT hypothetical plays. 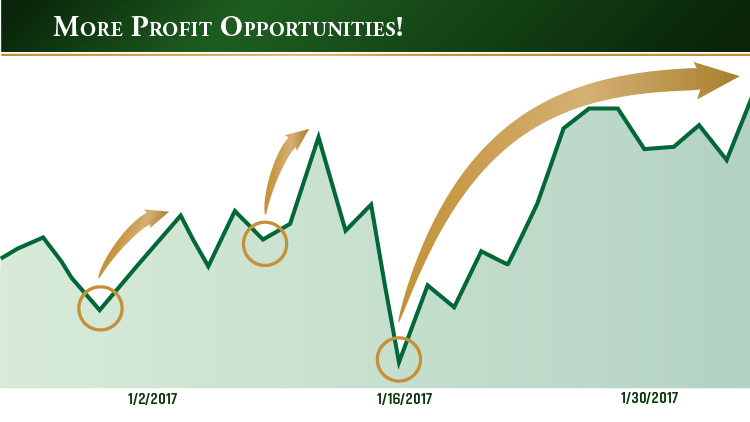 These are profit opportunities that a certain group of people following my wealth-building system could have cashed in on in just the first 11 weeks of this year alone. And that list of doubles and triples doesn’t even tell you half the story. There were actually eleven more opportunities to at least double your money in those first 11 weeks. I added four more to the calendar before the end of May. Then I added more doubles in June and July. And even more in August and September. That’s 42 chances to double or triple your money just since January. But as you can see, scoring strings of doubles and triples is The 10-Minute Millionaire’s entire focus. Every time I clock a triple-digit win, I get to mark it off on my trusty post-it note. And I want you to do the same thing. 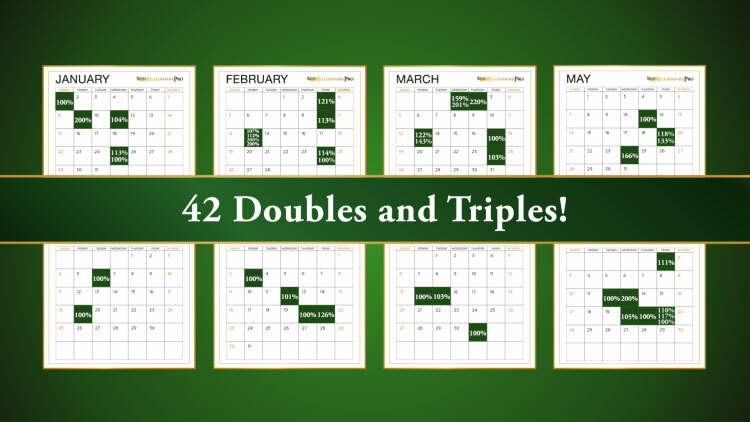 Do you think you could do it with the 42 doubles AND triples I’ve already produced this year? What if you started with $5,000 instead of just $500? I don’t think it’s possible… I know it’s possible. But as I’ve shown you, it’s a mathematical FACT that if you double and triple your money this many times over, you will become a millionaire. All you need in order to score consistent wins like this is a little know-how and a little guidance from someone who’s done it. But you still want life-changing money NOW. That’s precisely why I want to give you three free chances – along with my guidance – to double or triple your money! Or make you a $185,253 profit in just eight days! Which – as you’ll see – is my entire reason for offering you three immediate profit opportunities… and my valuable time for free. Which I would also like to send to you at no cost. Why should you believe anything I have to say? Again, my name is D.R. Barton. I’m a retired chemical engineer for DuPont. In fact, I retired at age 38. You see, I oversaw the construction of nuclear processing plants. There was absolutely no room for mistakes. If I made a mistake, the consequence could have been America’s very own Chernobyl nuclear disaster. So I had to be an expert in mathematics and physics. 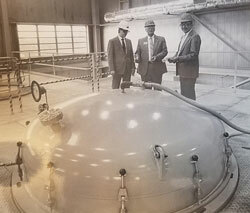 I had to be able to design nuclear material processing plants – involving millions of moving parts – and make them so simple that any minimally trained operator could run them and that all chances for mistakes were eliminated. And perhaps more importantly, I had to be obsessive about risk management to quite literally avoid disaster. A passion for mathematics and physics. The ability to simplify complex systems so anybody can understand them. And a world-class background in risk management. Now I’ve used these skills to create an investment strategy that has handed multiple millions of dollars in gains to those who have used it. 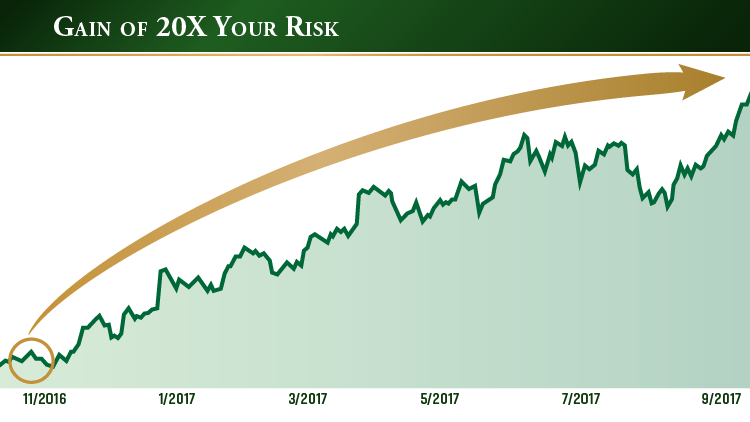 This system I’ve been telling you about allows you to go into 100% of your investments knowing that you have the chance to double your money… with minimum at risk. It’s a way of life… a belief system… an actual mindset that can allow you to live a much fuller life than you ever have. And once you set it up, practice it, and allow it to run, you’ll be able to maintain it in 10-minute increments – giving you the freedom to live as you please. Just keep turning the crank, and a steady stream of winning trades can pour from it. In fact, I’ve successfully taught sixth graders how to trade stocks! And if they can do it… just think how well you can do it. Now, to demonstrate exactly how it works, let me reveal one of the most powerful moneymaking strategies you’ll learn from The 10-Minute Millionaire. Very much like a slingshot can launch a projectile way farther than you or I could throw it. It’s easy to visualize exactly how it works when you see it. That’s a huge slingshot flinging a bowling ball 300 feet – the length of a football field. How far do you think you or I can throw a 16-pound ball? Maybe 10 feet? Well, with the help of a slingshot, you can send it 30-times farther. Of course, you know how a slingshot works. But let me briefly explain the physics behind it, so you can see exactly how it translates into making you money. K represents an enormous amount of stored or pent-up energy, just begging to be released. Now, the most important part of this equation is “X” – the point of maximum stored energy. 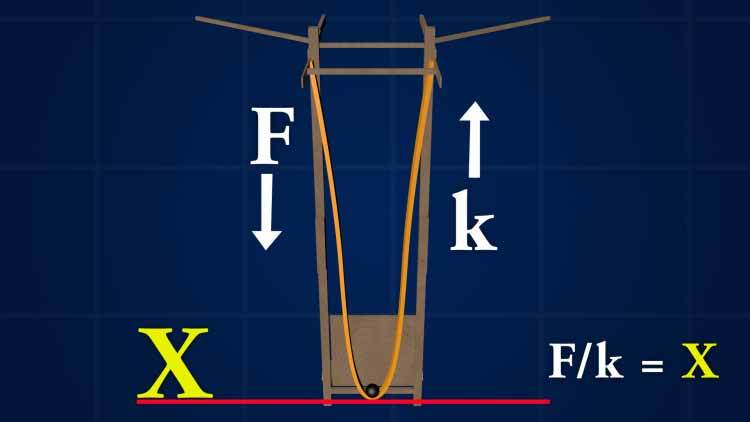 In this situation, X is the point at which the sling cannot be pulled back any more, and it absolutely must be released. Think about it like this… when you pull back on a slingshot, a bow, or any elastic band, how long can you hold it? AND you physically can’t hold onto it any longer because it wants to snap back so badly. This means you’ve reached the “X-point” – the point where you must let go. The overwhelming force pent-up in the elastic band whips back, sending the projectile way beyond where you or I could possibly heave it. The interesting thing is that this very same mathematical concept applies to investing. Every stock has the potential to store up immense amounts of energy, just like a slingshot. And you’re about to see how my secret “slingshot” method predicts with uncanny accuracy when individual stocks are primed to unload all of that energy. Again, it’s easy to visualize when you see it. This is a chart of Wynn Resorts’ stock price between April 2016 and January 2017. Imagine that each one of those yellow circles represents a slingshot being pulled back as far as it can go. And just like with the slingshot, there is only so far it can be pulled back before all of that pent-up energy simply must be released. As you can clearly see, that phenomenon created one big profit opportunity after another, over and over. You can imagine why I was dying to take advantage of this situation. 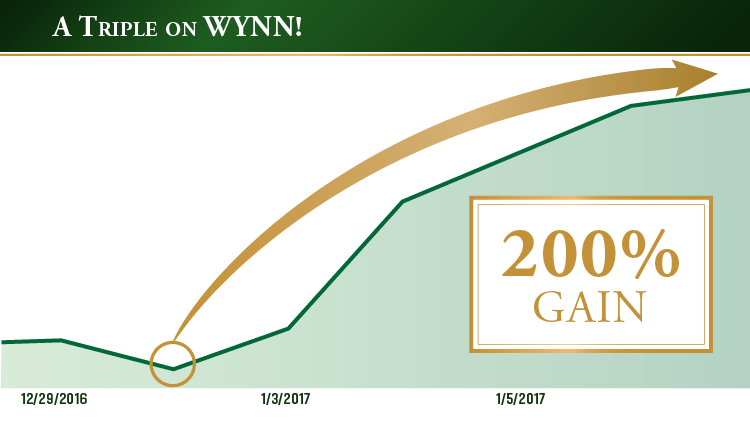 On December 29, my system alerted me that Wynn’s stock was approaching another “X-point” – the point of maximum pent-up energy. And I immediately contacted a group of people who follow my work. I simply told them it was time to “fire the slingshot” on Wynn Resorts. They all know what that means, and soon you will too. They can go to their computers and set up my “slingshot” method to take advantage of this situation. The whole process takes less than 10 minutes, because it’s as simple as pushing a couple of buttons. 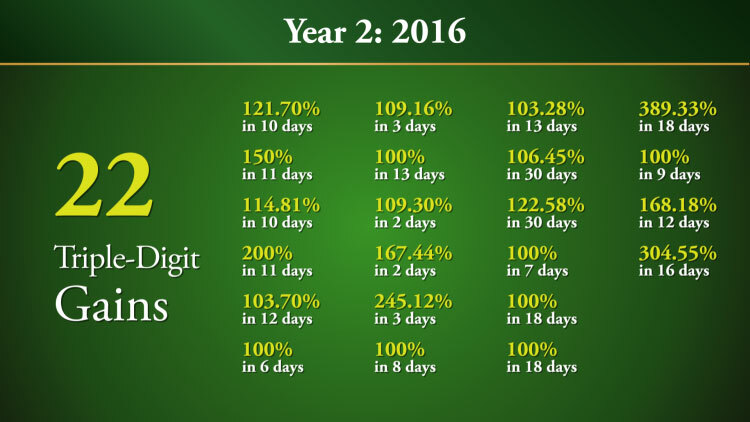 Anyone who “fired the slingshot” on Wynn Resorts – when I told them to – could have tripled their money with a massive 200% gain in just 11 days! And this same scenario plays out week after week, with dozens of stocks. 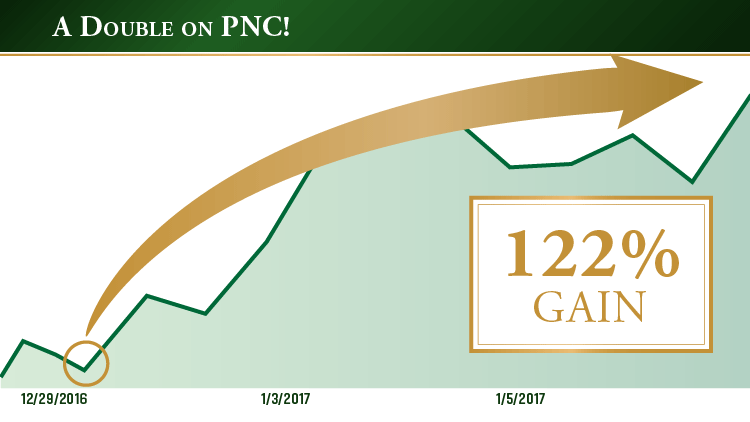 Take the bank PNC Financial. This stock was producing “X-points” left and right. In each instance, like a slingshot, the stock was drawn back to its point of maximum pent-up energy before it must be released. And my system precisely targeted the next money-doubling opportunity on January 18. I immediately alerted my people to “fire the slingshot” on PNC Financial. 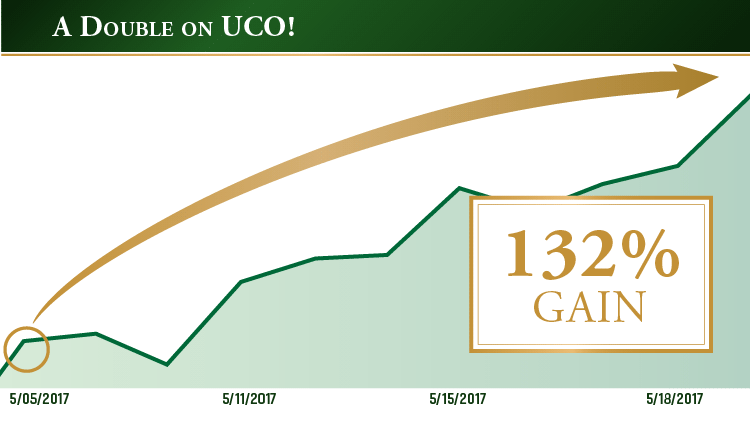 But we were able to perfectly harness the stock’s pent-up energy, and capture a 122% gain in 16 days. My system emotionlessly identified multiple “X-points” within the stock. And, again, it did exactly what it’s designed to do. 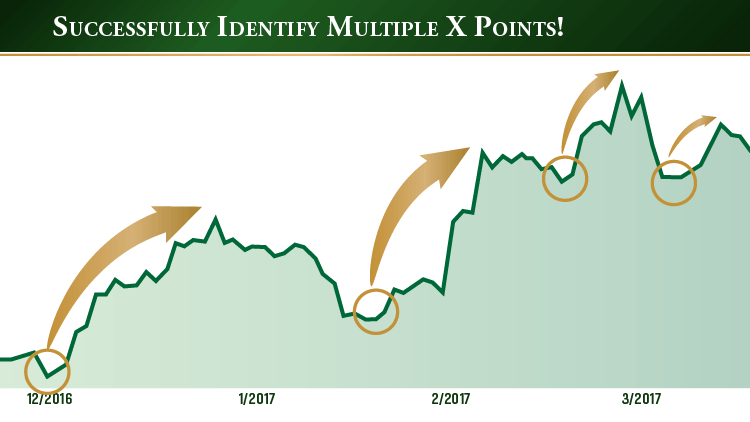 It pinpointed another triple-digit profit opportunity beginning on March 9. 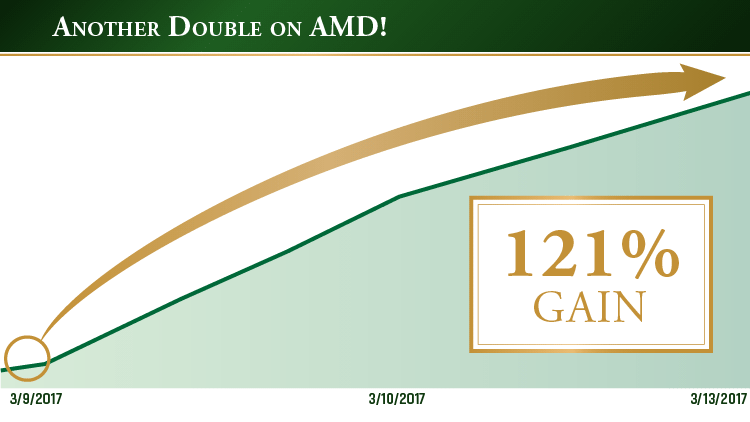 So I told everyone following my recommendations to immediately “fire the slingshot” on AMD. And just four days later, on March 13, anyone who pulled the trigger when I said to was able to make a quick 121% gain. Time and time again, this remarkable method continues to produce strings of triple-digit winners. 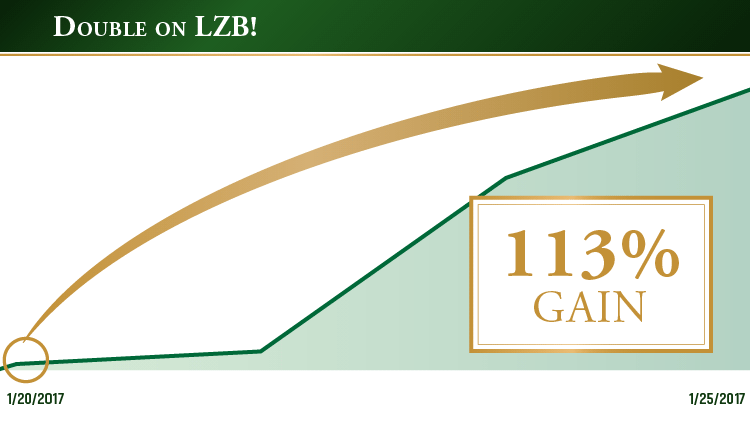 On January 20, I recommended “firing the slingshot” on La-Z-Boy, Inc.
By January 25 – only five days later – we doubled our money with a 113% gain. And we tripled our money with a 200% gain in 18 days. 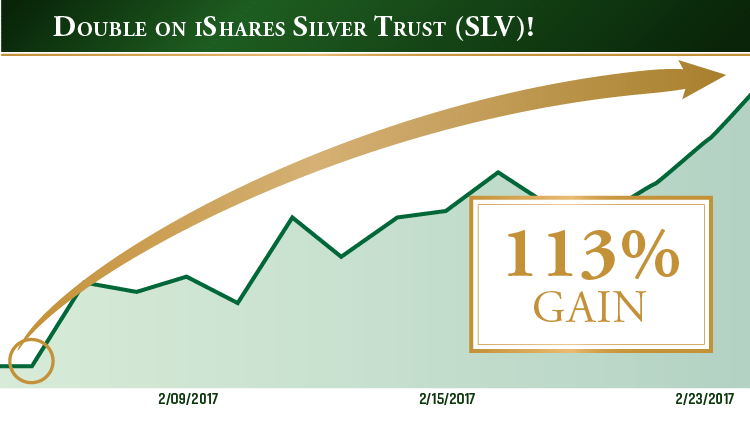 And scored another double with a 113% gain in 21 days. 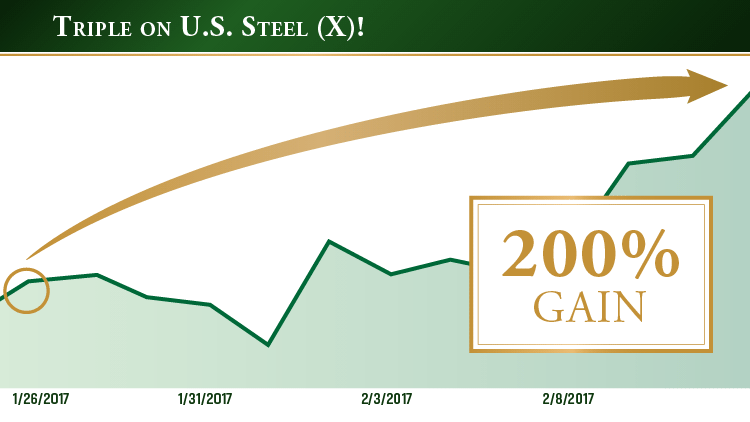 And captured a huge 202% gain – tripling our money again. All the incredible technical details are outlined in my book, The 10-Minute Millionaire. But what’s important to know is that my slingshot method acts as a force identifier… AND a force multiplier. It’s able to precisely identify when stocks reach their &ldquldquo;X-points” – the point of maximum stored energy. And it gives us the chance to leverage that pent-up power into strings of triple-digit windfalls. 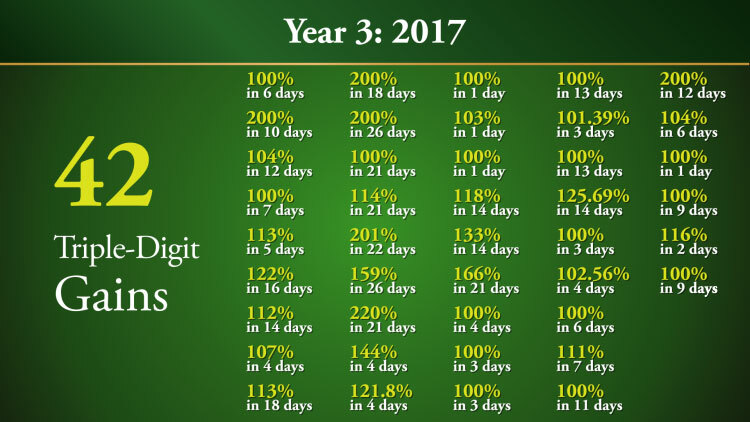 Keep in mind, the examples I’ve just shown you are only a few of the 42 chances to double or triple your money that I produced over the past 36 weeks alone. Naturally, I can’t guarantee gains like these, every time. No one can. But my track record speaks for itself. Those gains were no fluke… they’re simply a continuation. 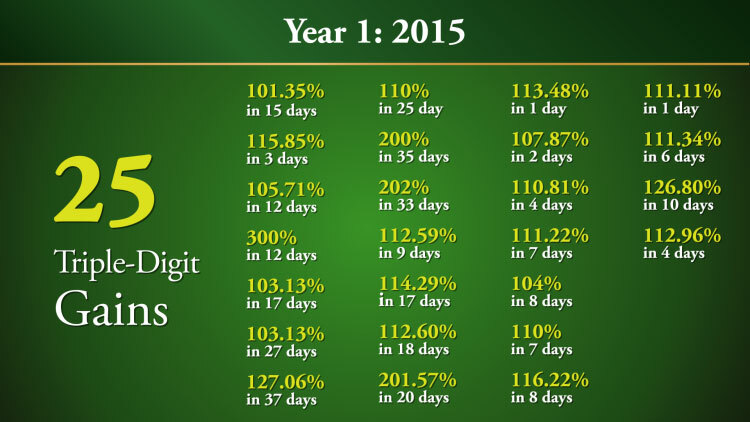 In 2015 alone, you would have had the opportunity to double or triple your money no less than 25 times. In 2016, you would have had 22 more opportunities to double or triple your money. And in just the last eight months, I produced 42 more triple-digit winners. 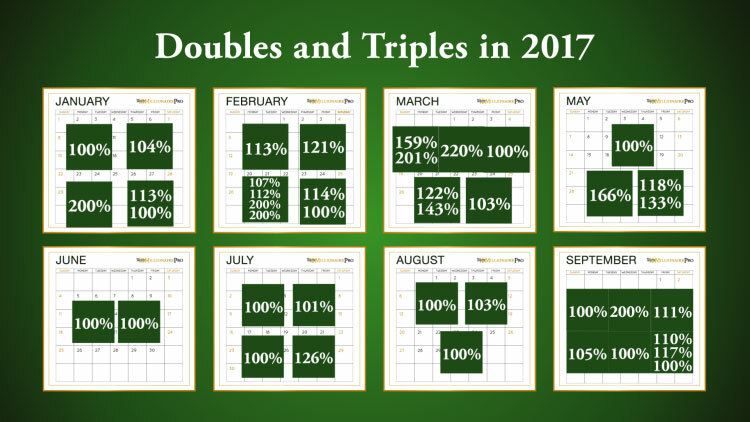 In total, that comes out to one chance to double or triple your money every 12 days… for two and a half years straight. How much wealthier do you think you’d be if you had the chance to double your money every 12 days for the next two and a half years? Remember, you only have to double your money 11 times to become a millionaire. And that’s just doubles. Throw a few triples in there, like I have, and you could get there even faster. But this is just one part of the equation. Learning how to “fire the slingshot” is just one of the incredible methods utilized with my 10-Minute Millionaire wealth-building strategy. Once you get your hands on my book, you can just go straight to page 40, where you’ll start learning why these unique profit opportunities are occurring with greater regularity. And you’ll learn how you can use my secret “slingshot” method to double and triple your money over and over. I’m also going to show you step-by-step how to do it in live demonstrations, so you see exactly how easy it is to do yourself. But there’s so much more to my 10-Minute Millionaire strategy! 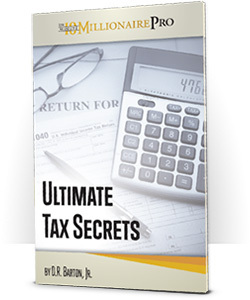 You’ll find all of my secrets for taking a few hundred dollars and turning it into $1 million in the book. And I’m ready to show you step by step – in a free demonstration – exactly how to play the three free white-hot profit opportunities I’m going to walk you through. And to prove how fast you can become a millionaire, starting from virtually nothing. Now look, focusing on the immediate upside is extremely important. You want a system like this one that has the potential to compound your wealth in a short amount of time. That’s what we all want to hear. But I’m not here just to tell you what you want to hear. I’m here to make you a millionaire faster than you ever thought possible. So I hope you’re listening, because what I’m about to say is of the highest importance to your success. Just focusing on the upside – like most investors who never become millionaires do – can also be extremely dangerous. Remember, as an engineer I became obsessed with risk management. And my obsession did not end there. I was also the co-founder and head of risk management for a hedge fund for more than a decade. In that position, if I made a bad decision, people could have lost millions of dollars. And it hammered home to me a critical point. After all, making triple-digit gains every 12 days on average is great, but it means nothing if you’re taking triple-digit losses. Going into 100% of your trades, you’ll have the chance to make many times the amount of money you have at risk – even as much as 20 times the amount. Say you’re only willing to risk $250 on any one trade. What most people don’t know is that it’s entirely possible to risk as little as $250 and make as much as $5,000! In October of 2016, my system indicated that Micron’s stock was about to go on a massive run to the upside. Anyone who followed my recommendation to buy shares immediately could have risked only $250… and they could have pulled in 20 times that amount by early 2017. That’s a 20-to-1 reward/risk ratio. I’d take that any day! And if you’re comfortable risking a little more, you could have doubled, tripled, and even quadrupled that amount… still with minimal at risk. You only risk $500… but you can walk away with $10,000! You only risk $1,000… but you can walk away with $20,000! You risk $5,000… but you can walk away with $100,000! There’s no doubt that winning trades where your profit is 20 times the amount you have at risk are very rare. But wouldn’t you even be happy with making three times, five times, or 10 times the amount you have at risk? Now think about the strings of winners that my system has helped me produce. In my book, I show you the critical – and super simple – actions you need to take to achieve this massive edge over the market. Then you’ll have almost complete control over the money you could be making. You’ll choose the amount of risk that you’re comfortable with, and you’ll have the opportunity to make as much as 20 times that amount. If only because you’ll have something that so few investors have… A PROVEN PLAN. 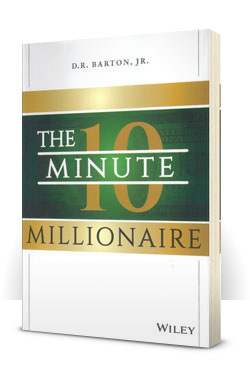 When I wrote The 10-Minute Millionaire, I wanted it to be something you could absorb quickly – and put to use almost immediately. 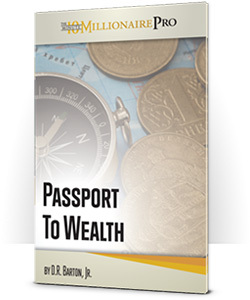 This is a roadmap to becoming a millionaire – plain and simple – which means the book also includes specific tools to help you along the way. My 10-Minute Millionaire system is a proven, repeatable, and reliable way to double your money over and over. And once you deploy this strategy, it acts as a sort of “trusted employee” that minds the store 24 hours a day, ideally making you money while you’re away enjoying a prosperous life. That’s enough time to make any new trades or adjustments necessary to keep it “running” flawlessly. Double your money… and go to the Bahamas. Triple your money 12 days later… and get that country club membership you always wanted. 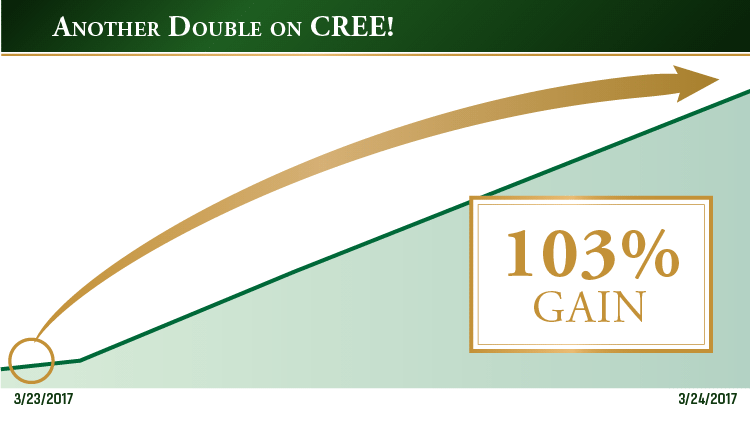 Double your money again 12 days after that… and make a sizable donation to your church or favorite charity. In fact, I want to get you started down this road right now. I’ll send you not just one, but three chances to double or even triple your money. With these three opportunities alone, you could conceivably take $500 and turn it into $4,000 or more. Or take $5,000 and turn it into $40,000. This will give you the chance to see for yourself just how effective my system can be… AND how fast it can work for you. As far as I can see, that’s the only thing missing here. And I’ve already given you hard proof that it works. I’ve shown you how my system could have helped you turn a few hundred bucks into $1,000,000 in the first 11 weeks of this year. 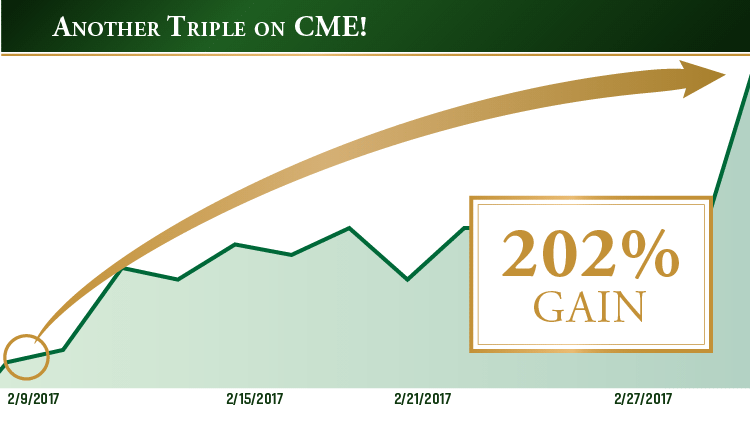 I’ve shown you how that was no fluke, because in 2015, I recommended 25 trades that doubled or tripled… followed by another 22 doubles and triples in 2016. And I’ve shown you how my system led me to produce yet another 42 chances to double and triple your money over the last several months. Or one chance to double your money every 12 days on average! And I’m going to guide you with THREE more chances to double your money, when you accept a free copy of my book. With opportunities just like these, Greg Alsop from Atlanta, Georgia, made a 22X profit. Bob Hansen of Topeka, Kansas, made $1,300 in his very first week. Geoff Miller, an investor from Flagstaff, Arizona, tripled his money almost right off the bat. And Nancy Leggett from Austin, Texas, made a quick 170%. With these first three opportunities, you could even potentially make $185,253 in eight days, like Jamie Newton did. That would definitely be exceptional, no doubt. There’s no way anyone could guarantee that kind of short-term gain. But I made a promise at the start of this presentation, and I’m a man who stands behind my promises. That’s why I’m not just going to send you down that road with one book and three guided chances to double your money. You’ll get tons of examples of how to make triple-digit gains in every kind of market – up, down or sideways – with minimal risk. Keeping your “work” down to about 10-minutes a week. Giving you almost complete control over your investments. And creating a “trusted employee” that can make you money while you’re out enjoying your life. You’ll get the nuts and bolts behind my entire 10-Minute Millionaire system in these short, 10-minute videos. I’ll provide you with three guided opportunities to double your money in the next few days. I’ll walk you through each opportunity, so you can see exactly how to set my system up to make you money. And these three opportunities are just to get you started. This alert includes a full rundown of my research and analysis of the play. And if you choose to act, you have all the necessary information right there to make a potential money-doubling investment. And, again, I give you step-by-step instructions on how to carry out the trade within 10 minutes. Here’s a Paycheck Alert for an investment recommendation in Hormel. It gets right to the point. As you can see, anyone who followed my recommendation could have made 150% in just 13 days. Sometimes these Paycheck Alerts can arrive much faster than that. For instance, 24 hours after I issued an Action Alert on a PowerShares ETF play, I followed it up with a Paycheck Alert, along with my analysis. In one day, that was a 113% gain. And it takes almost no effort on your part to collect profits like these! 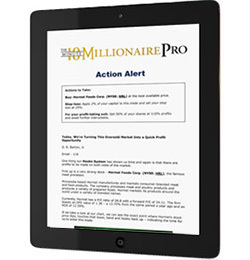 Wait for me to send you a 10-Minute Millionaire Action Alert. Decide if you want to take action. If you do, take 10 minutes to personalize your investment and simply input it into your brokerage account with a few keystrokes. Then wait for me to send you a Paycheck Alert. And write down your big wins. Keeping track of your progress leads to success! It keeps you accountable. It can guide your feedback to me. And that keeps us both focused on our goal: making you a millionaire. That’s why I’m going to send you this specially bound investment ledger, so you can log every step. I’m constantly talking to my 10-Minute Millionaires – providing motivation to keep pursuing your goal of being a millionaire. 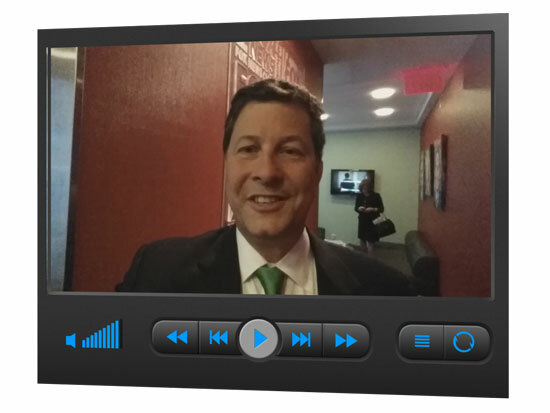 These videos serve as weekly “check-ins” where I’ll discuss our open trade recommendations. I’ll even address the most common questions I’m getting on them. But I like the finer things from time to time. I just don’t like to pay full price for them. That’s why I put together The 10-Minute Millionaire’s Passport to Wealth. It shows you how to go golfing in Scotland, take Caribbean vacations and European Cruises, buy the finest bottles of wine, and always have a table waiting for you at the best restaurant in town – all for pennies on the dollar. You don’t become a millionaire by following the conventional wisdom when it comes to your personal finances. This guide takes you off the beaten path to reveal the top CDs, money market funds, high-interest savings accounts, and alternative investments the rich use to get richer. Here’s something else to consider: What good is making all of this money if you just have to fork it over to the IRS? This guide helps you keep more of what you’ve rightfully earned. Don’t let the IRS come in and take more than their fair share. 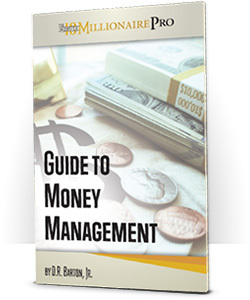 In this guide, I reveal 23 secrets that can help you to keep more of your money in your pocket. 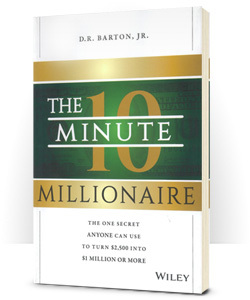 And don’t forget, you’ll also get a copy of my book, The 10-Minute Millionaire. Now, I’ve taught weekend courses where people paid upwards of $5,000 for this kind of guidance. And people have happily paid it. Because, as I said, it works like a charm. Woodrow Mann invested $606 in Apple. Because of one of the strategies he learned from my book, he walked away with $1,596 – a 163% return in just five days. She invested just $51.76 on Wynn Resorts, and she walked away with $285 – a 452% short-term gain. Four and a half times her money! Kelly Johnson invested in Chipotle and made a 450% return in less than a month – more than quintupling her money. Arnold Banks made a 290% profit – almost quadrupling his money. Don Clark more than doubled his money with a profit of 138%. Scott Bell made 156% – “about a $1,500 profit” – on his very first investment! With this many chances to double, triple, or even quadruple your money… I’d say $5,000 is a pretty good value. I’m offering you everything you’ve seen here for FREE. Why Am I Offering You All of This for Free? Well, I’ve spent my entire professional career with the goal of making a difference in other people’s lives. As an engineer, I worked to make products that would help my country and help others solve problems. After I took an early retirement from engineering and became a millionaire myself, I thanked God for my success, and I prayed about how I could give back. The answer was to publish my findings and do my best to help at least 500 people retire with a better life… like I did. I’ve also encouraged them to adopt the attitude to use their wealth to do the most good they can for others. It means giving to my church and other charities… teaching Sunday school… and getting involved in my true passion, which is ministry. That’s why I’m not charging $5,000 for this commitment of my time and resources to help you succeed at becoming a millionaire. Because I want to help as many people as I can to achieve the lifestyle of their dreams… and to be able to “pay it forward” in whatever way you see fit. It’s all free when you become a member of my monthly newsletter The 10-Minute Millionaire Pro. 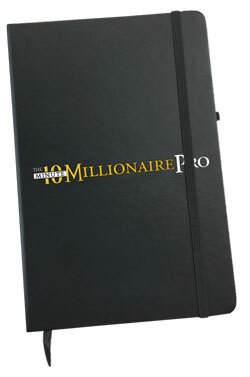 As a member, each month you’ll receive a fresh issue of The 10-Minute Millionaire Pro in your mailbox. It’s filled with more investment opportunities, market trend analysis, and wealth management tools. 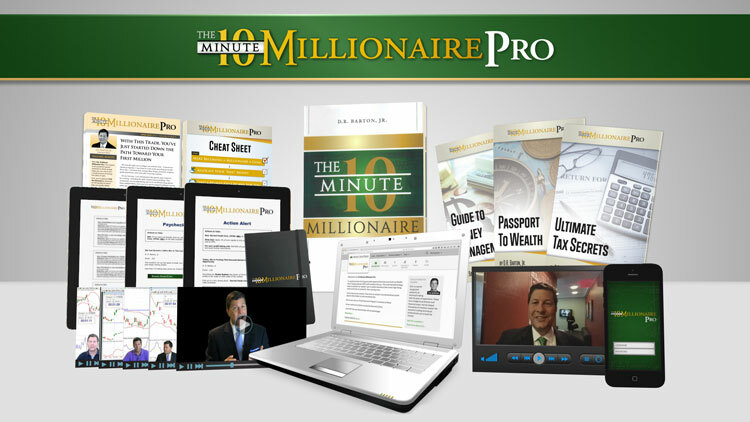 The 10-Minute Millionaire Pro is the vehicle that allows me to be hands-on in guiding as many people as I can toward the goal of being a millionaire. It’s the medium through which I communicate with my subscribers. It’s the cornerstone of a community of like-minded individuals who are all striving to achieve financial freedom – even millionaire status. The price to join The 10-Minute Millionaire Pro community is $299 a year. In addition, you’ll get all of the tools I’ve shared with you today, along with my guidance. Remember, many people have paid upwards of $5,000 for just a weekend of this level of access. But the reason I’m offering all of my time, effort, and tools to you… is because The 10-Minute Millionaire Pro newsletter allows me to reach out and help more people with my research and videos than I ever could in a weekend course. I’m putting my money where my mouth is and offering you this incredible discount. 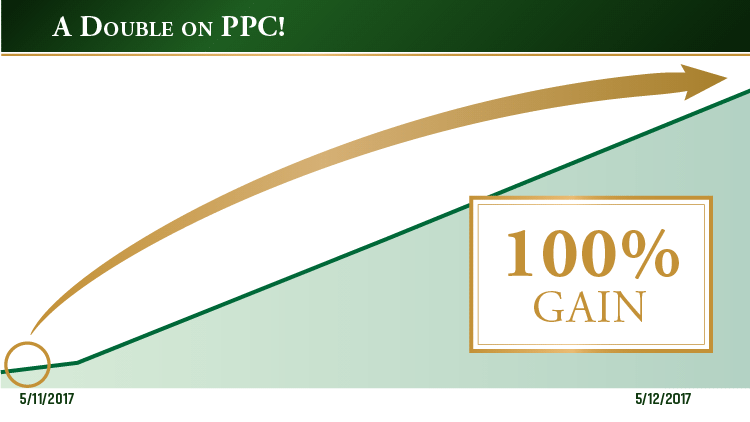 I’m also backing that up with two 100% money-back guarantees. First, if you’re not satisfied with the guidance and money-doubling opportunities I’ve given you at any time within the first 90 days of your membership, you can cancel it and get a 100% refund. And second, if I haven’t given you the chance to close out at least 12 trades for 100% gains or higher, by the end of your first 12 months, simply contact my team and you’ll get back every penny of your subscription fee. So mark your calendar, because I expect you to hold me accountable for these two guarantees. I think you’ll agree that’s about as fair as it gets. Remember, there are only 500 membership slots available today. If you secure one of them, I’m going to authorize an 87% discount off the normal annual rate. This will give you the opportunity to get started right away. And before you know it, you’ll be in a position to double, triple, and quadruple your way to your first $1 million. So let’s not waste another moment! To get started, click the button below. You’ll be taken to a secure page where you can review the details, before filling out a simple membership form. I want to thank you for joining me today.